Your laboratory has established a technique for examining DNA replication in a cellular extract. To the cellular protein extract, you add nucleotides, a small amount of radiolabeled 32P-dGTP to aid visualization of the synthesized DNA, and a 4000-base-pair linear double-stranded DNA molecule that contains an origin of replication in the middle. After allowing the reaction to proceed for 30 minutes at 30°C, you boil the mixture to denature the proteins and the DNA strands, separate the components on an acrylamide gel, and detect the radiolabeled DNA products. This complete reaction is shown in lane 2 on the gel in the Figure below. You perform the assay by yourself for the first time with no one else is in lab. The tube labeled “nucleotide mixture” has only enough for a single reaction, but you find a tube with a label that reads “dATP, dTTP, dGTP, dCTP” and you use this in a second reaction. You find the first reaction looks like lane 2 and the second reaction looks like lane 3. Why was no DNA synthesized in the second reaction? Because deoxyribose triphosphates do not have a –OH group to attach. You essentially can’t build with them. Your lab partner has recently isolated a mutant strain that can replicate its DNA normally at 30°C but exhibit no DNA replication at 40°C. He calls the mutant tsr1, for Temperature Sensitive Replication. The wild-type strain replicates efficiently at both temperatures. You believe that you can use the biochemical assay of cell extracts to identify which genes are defective in the mutant. You grow wild-type cells and tsr1 cells at 40°C, make the extracts, incubate the DNA replication reaction at 40°C, and detect the products on a gel. You observe the pattern shown in lanes 4 and 5. You are so excited by the results that you run to your lab partner and tell him that you know what enzyme is defective. He is delighted by your results but says that there are three different enzymes that can account for your results. What are they? I am 100% lost on this one. I understand from the figure that the wild-type at 40 degrees has 4000 nucleotides so it's not being cut off. The mutant, trs1 is being cut off one into two slices of 2000 and one of these slices has been cut off into slices of 500? Am I understanding this correctly? I also don't understand why the 500 line is so thick compared to the others? Anyhow I feel really confused on this. 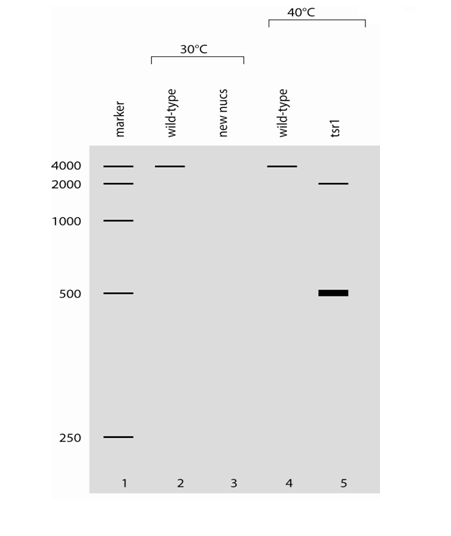 I've been learning about Sanger sequencing and it makes 100% sense with ddXTP added into the mix to view the length of each sequence and therefore be able to read the sequence, but I'm not even sure if that's what's happening here. Even though you - or the problem did not clarify, I assume in my answer that you work with eukaryote system, even though the principle of the replication is the same. dNTPs do have an OH group on their 3rd carbon atom (for eg. check this wiki-page for dCTP) so I don't think that's the issue here. My guess is that the first tube contains the radio labeled GTP and the second does not, so even the DNA is there, you cannot see it - even though the question specifically asked why DNA was not synthesized, my opinion is that it's a tricky question to confuse you. DNA Ligase - the one responsible for ligating (joining ) the lagging strand's fragments. Polymerase delta (Pol δ): That is responsible for lagging strand synthesis and primer removal - in this case the primer removal function might be defective, this causes that the primers stay on the DNA and complete synthesis and ligation cannot occur. The last protein although it is not quite an enzyme is the DNA clamp complex (PCNA). This complex stabilizes the polymerase to DNA, but when reaching a previous fragment the polymerase should dissociate. But if the clamp is dysfunctional than the polymerase gets stuck on the end of the fragment thus no primer removal and ligation can occur. If need more info read this wiki-page. Not the answer you're looking for? Browse other questions tagged genetics dna homework dna-sequencing or ask your own question.